Evolution of a Foodie: Rainbow Honey April 2014 Mystery Bag Review and Giveaway! 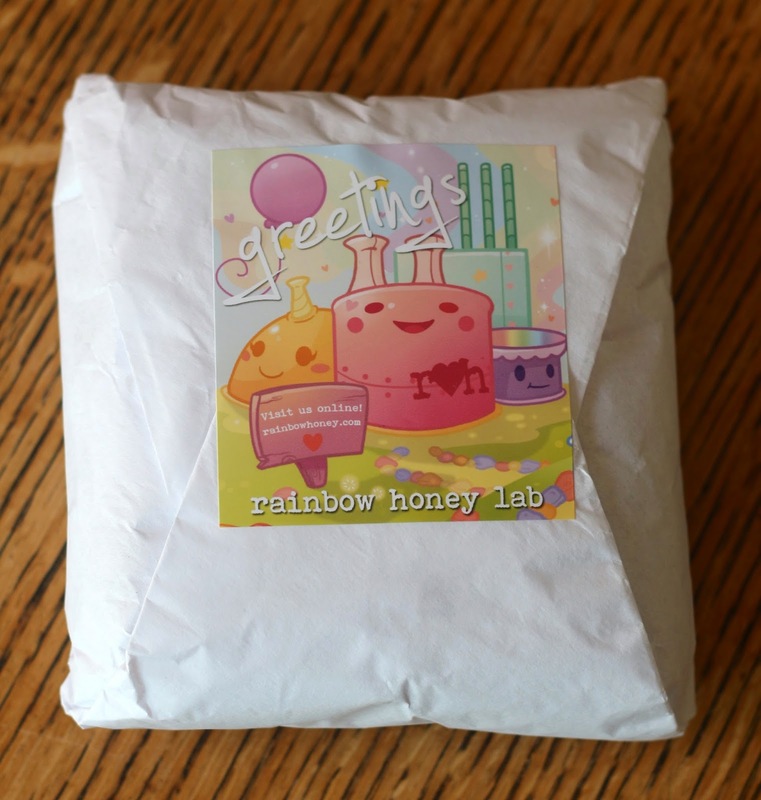 Rainbow Honey April 2014 Mystery Bag Review and Giveaway! 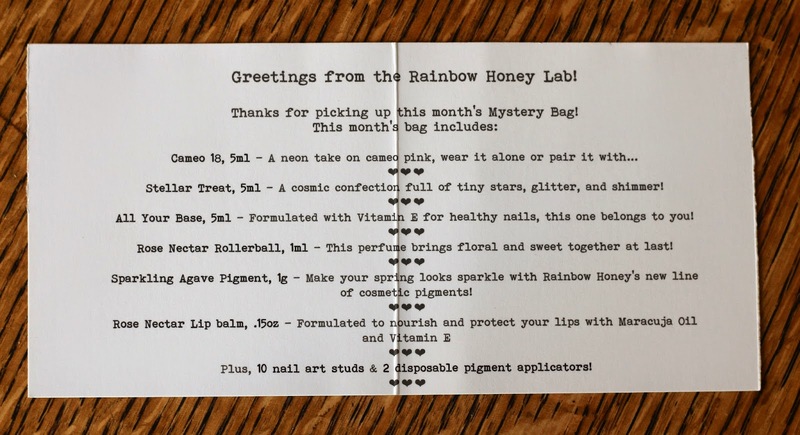 I have been frequenting the Julep Swap Facebook group, and many of the ladies of the group were talking about the Rainbow Honey Mystery Bags. I am a total Indie polish noob, so I went exploring the Rainbow Honey site, and found so many pretty colors! I want them all, but I decided a nice way to try their products would be to get an April Mystery Bag! 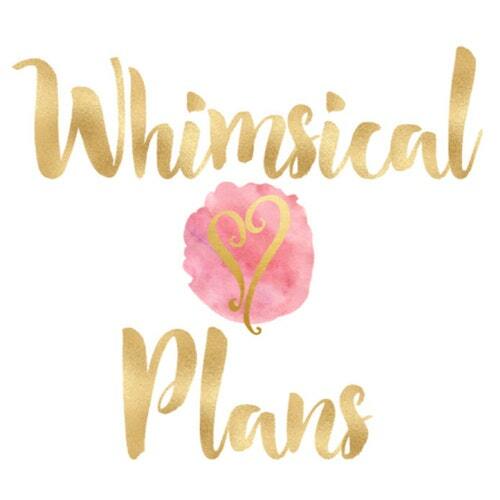 They recently introduced a subscription bag that starts in May, offering the mini or the large size Mystery Bag for $10 or $25 per month respectively. It seems they will still be offering the one-off monthly Mystery Bags as well, so I may just do that. Then I can wait for the spoilers, and decide if I want it at all, or if I want just the mini, or splurge for the large bag. It's a great way to try their new products first, because they get released in the Mystery Bag before they are sold separately on the site. The Mystery Bag is all wrapped up with this adorable sticker holding it all together. It includes an info card with all the items and this month's Mystery Bag was chock full of products! I got the mini Mystery Bag which is $10+shipping, and it includes almost everything the same as the large Mystery Bag but has full size polishes and products. 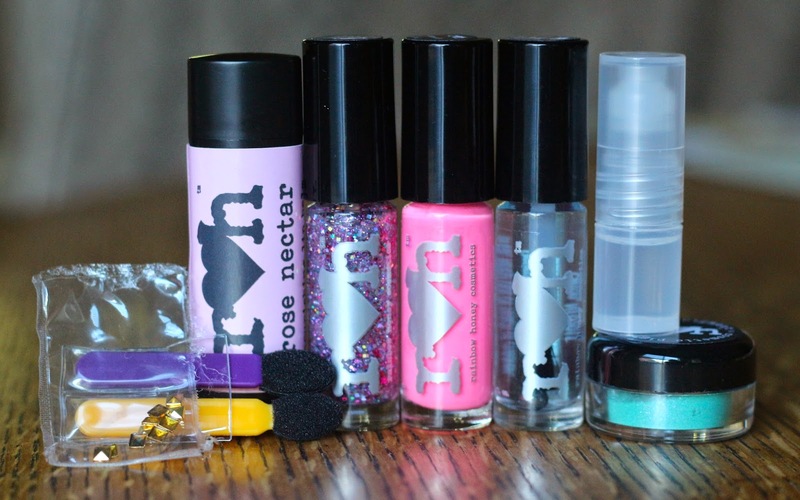 Here are the polishes for April, they are 5ml minis, and they are adorable! Cameo 18 - This is a light neon pink and I love it! It's definitely a color I don't have anything like already, and I think it will be great for Spring. Stellar Treat - I just used this today because I needed a new mani. It's very pretty, tiny pink, teal, and silver square glitters with pink star glitter. It's a good glitter topper, or can be used for a jelly sandwich, which is what I did. All Your Base - This is a base coat, which was great because I don't have one. I need it for some of my colors that stain my nails, mostly greens and yellows. I've heard this peels really easily, but I'll have to try it to see for myself. Here are the products for the April Mystery Bag, all minis. 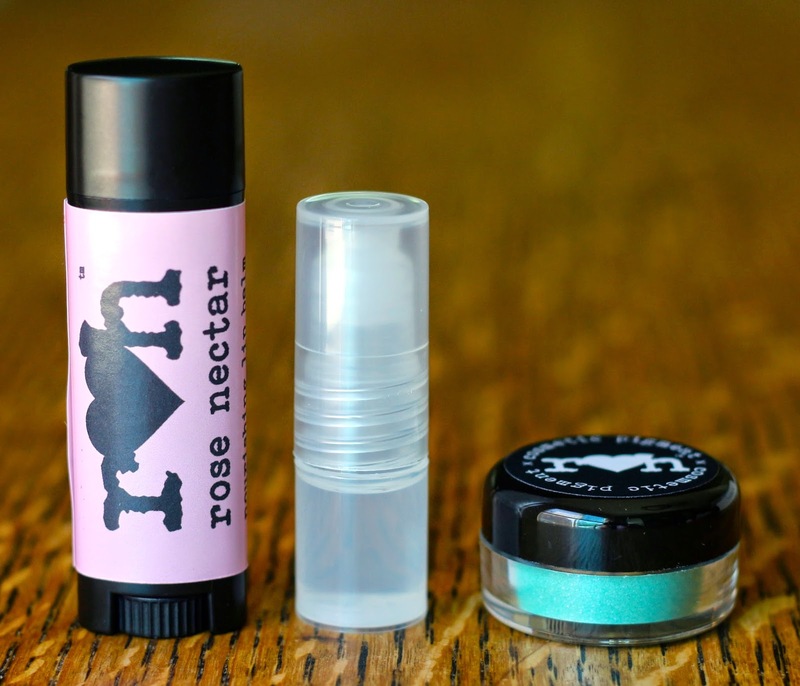 Rose Nectar Lip Balm - I've been wearing this all day, it's a wonderful formula and scent. The rose is very light and combined with something else sweet to dilute the heaviness that rose can have sometimes. Rose Nectar Rollerball - Wow I never would have imagined I'd find a rose perfume that didn't smell old lady on me, but here it is! This smells lovely, and I've been wearing it all day. I would definitely say you'll need to reapply this but it mellows out nicely throughout the day. Sparkling Agave Pigment - I love this color, I want to try some eye look with it sometime soon. My first inclination is as an eyeliner, but maybe I can come up with something else to try too. 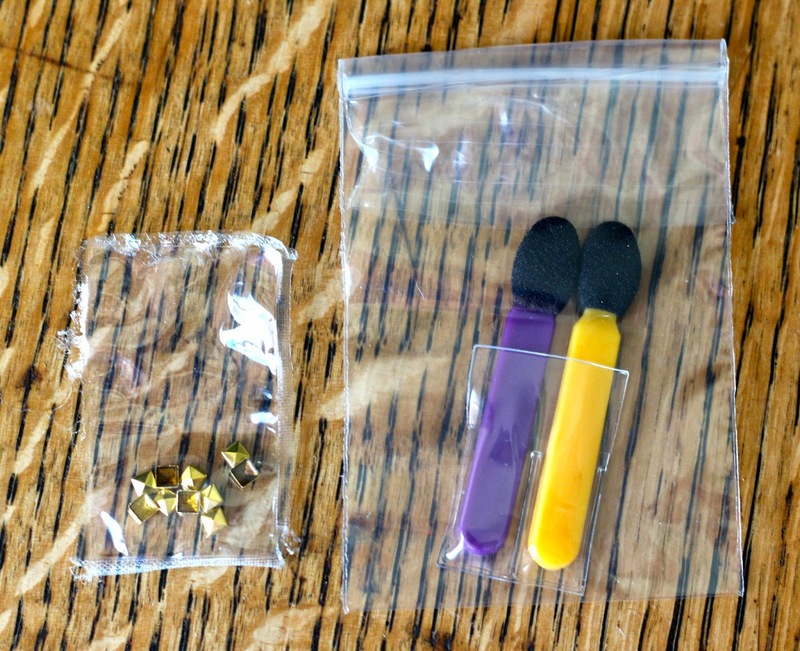 These are the bonus extras this month, 10 gold nail art studs, and two pigment applicators. I do want to try the studs I've seen some great nail art designs utilizing them. The applicators aren't my favorite kind, but they might be nice for travel. All in all, I really loved this month's Mystery Bag and I can't wait to make a big polish order, and for next month's bag! I'm a Rainbow Honey convert! Use code IPSY25 for 25% off your Rainbow Honey order! If you'd like to win an April Rainbow Honey Mini Mystery Bag of your own, with all the products you see here in this review you can enter below with the Rafflecopter widget! I love how rainbow honey have a lot of practical products other than nail polish. I'd like to try out their base coat though. Can't have enough of that! The second I saw that they had a polish called "All Your Base," I knew they were cool. 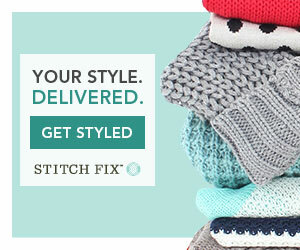 I'm going to have to check out their site! I'm trying to decide whether to upgrade to the large size bag this month, and happy to find your review! 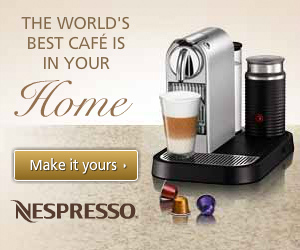 The large size will have the same products, but in full size. The polish colors and products are the same items, but the large also includes an additional product or two. This month I believe it is a hand cream sample. I hope that helps! I just put in an order for a mini bag for May. It's my birthday month and their colors and glitters look so interesting! I'll definitely have to pick up their base coat too, with all the rave reviews! I have never tried Rainbow Honey so I am really excited about this giveaway! I love the two colored polishes, I'm a sucker for pinks and purples! Also I've never had a base coat before so I would love to try it out! I am really really excited, I hope I win! That Agave pigment looks amazing! I would love to win!! I'm obsessed with the lip balm!! Thank you for the great reviews, and all the spoilers! I really want to try Rainbow Honey, this would be an awesome win! I really need a new base coat and All Your Base seems to fit the bill.